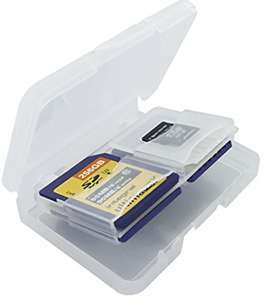 Nice little container to keep 4 of your memory cards neat and safe in your bag, on your desk or in your drawer. Perfect for those who film or photograph for their job or hobby! Available under £1 if you use 3rd party seller, with free delivery. Yay more cheap disposable bulky plastic junk to keep the small plastic stuff in. Damnit I wanted to store 1 SD card and 3 microSD cards. Whatever shall I do? Yay more cheap disposable bulky plastic junk to keep the small plastic …Yay more cheap disposable bulky plastic junk to keep the small plastic stuff in.Damnit I wanted to store 1 SD card and 3 microSD cards. Whatever shall I do? What was the purpose of your post? This product clearly serves a need for people who need to travel with multiple SD cards. Just because you don't have that need, doesn't mean that nobody does. So with the greatest of respect and all sincerity, kindly jump down off your pedestal and take a quick jog towards Dover and beyond. Yay another HUKD member who's only contributed one deal in 12 years of being a member. Dammit, for a second then I nearly gave a damn.